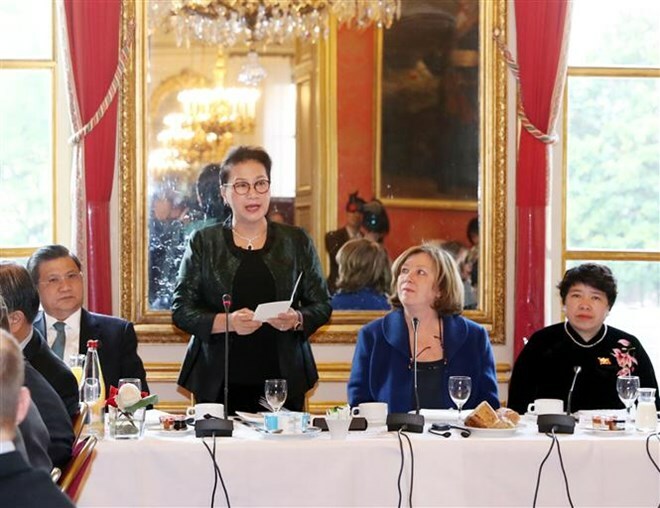 NA Chairwoman Nguyen Thi Kim Ngan delivered the commitment at a working breakfast with the France-Vietnam Friendship Parliamentarians’ Group and representatives of 15 major French businesses in Paris on April 1. Ngan said the Vietnamese NA delegation’s ongoing visit aims to promote and deepen the Vietnam-France strategic partnership, as well as bilateral legislative ties in particular, helping to enhance the multifaceted cooperation between the two countries with economic-trade collaboration as the centre. She highly evaluated France’s policy on strengthening economic cooperation with Vietnam and hoped that French firms will expand their business and investment in the Southeast Asian country. 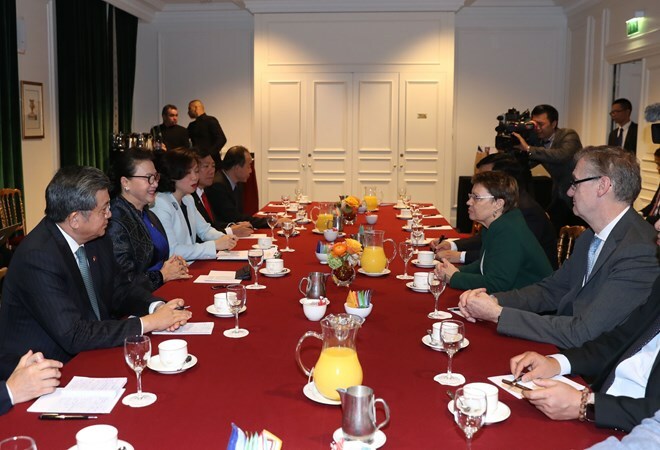 At the working breakfast, representatives of French enterprises such as Air Liquide and Total spoke highly of the Vietnamese market’s potential in energy, especially renewal energy. Meanwhile, representatives of other businesses showed their interest in the fields of aviation infrastructure development, logistics, pharmaceuticals, health care, wholesale market building and clean food supply. In the sphere of energy, a representative of the Vietnamese Ministry of Industry and Trade affirmed Vietnam’s support for projects involving French companies, saying the country will create all possible conditions so that the projects are implemented effectively and on schedule. NA Chairwoman Nguyen Thi Kim Ngan meets with representatives of French enterprises. A representative of the NA’s Committee for Legal Affairs said the Vietnamese legislature will continue to further study the Law on Investment in order to make it easier for investors to participate in projects in Vietnam. The Vietnamese NA will also amend the Law on Intellectual Property in May to satisfy conditions of economic integration, the official added. Leaders of Vietnamese ministries, agencies and localities talked about investment opportunities and potential in Vietnam, particularly in aviation and metro, stressing that French businesses and investors are able to take part in these projects. They also committed to creating optimal conditions for French businesses and investors to approach master planning schemes to clearly identify their investment plans. An official of Hanoi city briefed on the progress of some projects involved in French partners, including a hospital exclusively for mothers and children, whose construction will begin in May 2019 and is expected to be completed in October 2020, a centre of emergency aid in combination with firefighting, and a farm produce wholesale market in Gia Lam district. In her closing speech, Ngan said the Vietnamese NA will work harder to complete laws regarding economic affairs, in line with international practices and integration process Vietnam has committed in free trade agreements (FTAs), thus ensuring transparency, publicity and equality for both domestic and foreign investors. The Vietnamese Government will create a competitive, favourable and open investment environment, and carry out intensive and extensive administrative reforms, from the stage of corporate establishment to customs and tax affairs, she said. Vietnam is stepping up infrastructure development and economic investment programmes with high connectivity, towards a digital economy and smart urban cities, Ngan added. Along with e-government, the legislature will build an e-parliament, she said, noting that the legislative agency will accompany businesses and investors, helping remove their difficulties. In an interview granted to French daily newspaper L’Opinion about Vietnam’s economic prospects, the Vietnamese top legislator said that the Vietnamese economy will continue its rapid, sustainable and inclusive growth based on a strong domestic market of 95 million people with increasing incomes. The creativity and aspirations for moving ahead of Vietnamese people, especially young people under 35 years old who account for up to 60 percent of the population, are considered as momentum for the nation’s development process, she said. Besides, Vietnam is renewing its growth model based on renovation and creativity and digital economic transformation, while encouraging the development of startups, taking advantages of the Fourth Industrial Revolution and promoting the private economic sector, Ngan stressed. The country is also improving its legal frameworks towards a modern market economy in conformity to international standards and commitments in new-generation free trade agreements (FTAs), she said. With 12 signed FTAs, including the Comprehensive and Progressive Agreement for Trans-Pacific Partnership (CPTPP), EU-Vietnam Free Trade Agreement (EVFTA) and FTAs with such important markets as ASEAN, China, Japan and Russia, Vietnam has taken a further step in the global integration process, she underlined. Regarding the EVFTA’s impacts on Vietnamese trade prospects, the Chairwoman highlighted the importance of the deal, in terms of both strategy and economy-commerce, as it will open various cooperation opportunities for Vietnam and the EU. Both sides need to finalise relevant procedures so as to soon sign and ratify the pact, ensuring that it will take effect as soon as possible, she noted. Regarding Vietnam-France relations, Ngan affirmed that the bilateral ties are enjoying an impetus for further growth, with a line-up of delegation exchanges at all levels and cooperation mechanisms. Particularly, cooperative ties between Vietnamese and French localities have contributed remarkably to the bilateral relations. According to the top legislator, France has remained a big trade partner and an important investor of Vietnam, and both countries, as active members of the international community, have shared a number of common viewpoints, laying the foundation for bilateral coordination at international forums and multilateral cooperation mechanisms. Besides, Vietnam and France are pursuing joint efforts for global peace and stability as well as adaptation to global challenges. Ngan also affirmed that the Vietnamese community in France in the largest of its kind in Europe, and they have obtained achievements in various sectors while many of them have held important positions in the local and central administrations of France. 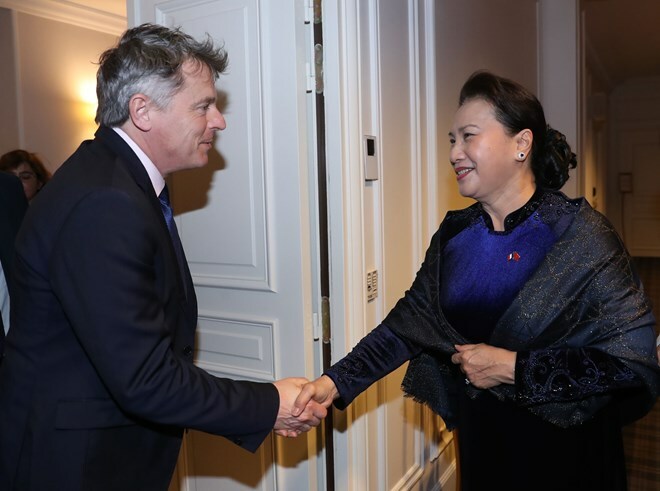 The NA Chairwoman expressed her hope that the Vietnamese community in France will make further contributions to both the host nation and their homeland. National Assembly Chairwoman Nguyen Thi Kim Ngan on April 1 receives representatives from SAFRAN - the aerospace and defense group of France as part of her on-going visit to the European country. During the reception, the Vietnamese top legislator said her visit aims to further promote the strategic partnership with France, including economic, trade and investment cooperation. 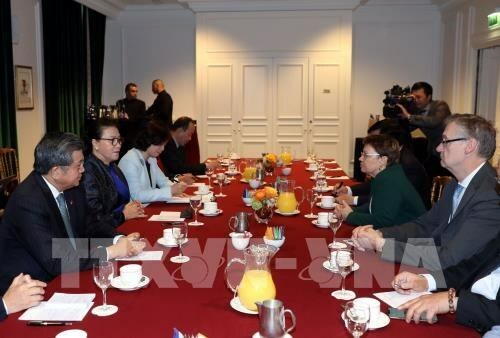 While briefing the result of her working session with representatives from 15 French enterprises earlier the same day, NA Chairwoman Ngan said many French firms eye to invest in Vietnam, adding 200 French firms are investing in the Southeast Asian nation. However, she said, two-way trade between Vietnam and France has not matched with their cooperation potential, reaching only 5 billion USD in 2018. Representatives from SAFRAN said it is the global leading aviation industry group in France and the world with 92,000 staff. The firm is operating in the two main fields: aviation and aerospace. In Vietnam, SAFRAN set up cooperative ties with partners in 1994 and officially opened its reprensentative in 1997. The group’s presence in Vietnam has been stronger since Vietjet Air was formed. SAFRAN is willing to expand economic and trade cooperation with Vietnam, said the group’s representatives. NA Chairwoman Ngan thanked SAFRAN for its presence in Vietnam over the last 22 years, and congratulated the group on its cooperation with strategic partners in Vietnam. She suggested leaders of the group consider building facilities for maintaining engines, producing spare parts and essential supplies for the aviation industry in Vietnam; transferring support industrial technology for Vietnam and helping develop human resources working in this industry, towards increasing the efficiency of cooperation. Vietnam pledges to create favourable legal environment for operations of foreign firms, including SAFRAN, in Vietnam, Ngan affirmed. Chairwoman of the Vietnamese National Assembly (NA) Nguyen Thi Kim Ngan (R) receives National Secretary of the French Communist Party (PCF) Fabien Roussel. Ngan, who is an official visit to the European country as guest of President of the French NA Richard Ferrand, conveyed greetings and congratulations of leaders of the Communist Party of Vietnam (CPV) to Roussel on his election as National Secretary of the PCF at its 38th congress. The two leaders noted with pleasure the strong development of Vietnam-France relations after the establishment of diplomatic ties 46 years ago and the strategic partnership five years ago. More and more cooperation channels have been set up between the states, legislative bodies, the CPV and the PCF, localities and businesses of the two countries, they said. Ngan briefed Roussel on Vietnam’s socio-economic development, with economic growth of over 7 percent in 2018, the highest pace in the region. Vietnam is building a socialist-oriented market economy, she said, adding that after three years of implementation of the five-year socio-economic plan set at the 12th National Congress of the CPV in 2016, many targets have been fulfilled. More than 4 million Party members have served as the core force in realising the CPV’s policies and guidelines, the top legislator said. The CPV has regularly rectified its staff and built a pure, strong Party, she said, adding NA deputies, on behalf of the people, have cast votes of confidence on high-ranking officials holding positions elected or approved by the legislature. Roussel, for his part, hailed Vietnam’s socio-economic achievements under the leadership of the CPV, while congratulating the CPV on its political successes since its inception and in leading the Vietnamese people in the past struggle for national liberation and unification as well as in the current cause of socio-economic development. As Vietnam has been on the right track of development, communist parties of other countries will be inspired from its standout achievements in the past years, he said. Mentioning the fierce competition, trade disputes and trade wars which have made unemployment rate and poverty increase globally, Roussel said communist parties worldwide should further cooperation in the coming time and expected that the relationship between the PCF and the CPV would strongly develop. Ngan affirmed that the CPV always attached much importance to the friendship and solidarity with the PCF. She appraised the French party’s role and contributions to France’s political arena and development. The CPV has treasured cooperation with progressive forces across the world, she said, stressing that Vietnam has pursued an open foreign policy of multilateralization and diversification of international relations, and Vietnam wants to be a trustworthy friend and partner of all countries in the globe. She wished that the PCF will promote its role at localities, political arenas and international forums to support relations between France, the EU and Vietnam. Ngan took the occasion to convey CPV General Secretary and President Nguyen Phu Trong’s invitation to Roussel to visit Vietnam at a proper time.